Forget the matchup record history. Forget the fact that Atletico Madrid haven’t beaten Barcelona in LaLiga in seven years and forget the fact that Barca have slightly better players. Why? Because at ESDF analysis we analyze full-90 minute performances and not just results. And if we’re talking about performances then we must mention that Atletico were superior to Barcelona on three occasions last season – once at the Vicente Calderon (LaLiga) and twice across both Copa del Rey legs. Barcelona were just efficient in front of goal when it mattered last season. With that said, Ernesto Valverde’s men are still undefeated in the current Primera Division campaign and are still the favourites coming into Saturday’s match at the Wanda Metropolitano. Improved pressing phases and off-the-ball work. Before we break down the areas of improvement, it should be noted that Barcelona’s underperforming 16/17 season was the result of multiple factors. Despite this; they were never far off from returning to European behemoth standards. They just needed some midfield rejuvenation, additional transfer reinforcements, and a new tactical system. Their off-the-ball work rate, counter-pressing, and mid-block pressing systems are some of the most noticeable differences, so we’ll start with one of the aspects of their team defending. How Will Barcelona defend in a mid-block? 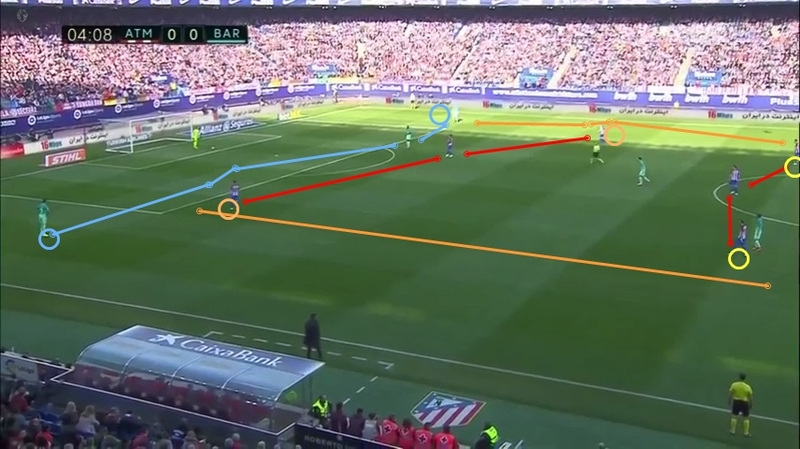 In the event that Atleti high-press and look to force Barca into a defensive shell (it’s possible) upon attaining possession, then Barca may look to try and push Atletico’s possession formation backward by triggering their pressing traps. Last season, when Atletico hosted Barcelona at the Calderon in February, Simeone’s men high-pressed the Catalan giants extremely well in a 4-3-3 man-marking system. Have a look, below. In fact, Barca spent most of that first-half defending in a low-block 4-4-2 without any of their trademark pressing. Simeone’s men were so good that they forced Barca to change their tactics. It’s very rare, to be honest, but Atleti did it. In that match, Atleti tried many overloads down Barca’s right side and only tried crosses from Barca’s left. This was because Atleti didn’t want to lose the ball on Barca’s left-flank and give Neymar a counter on his natural playing side. But Simeone’s outfit won’t have to worry about that anymore as the Brazilian superstar took his talents to Paris. Anyway, that was Luis Enrique’s Barcelona, and now Valverde will be eager to see how his outfit can press against a tougher opponent. Below, you can see how Barcelona man-marked their way out of their 4-5-1 mid-block to push Eibar backwards. They’ll likely do this against Atleti, as well, if they’re not pinned back into their own box. We should also take note of how Atletico’s wide possession-based and overload/crossing style (when not counter-attacking) will influence Barca’s defensive mid-block. In the first-leg of the Spanish Super Cup against Real Madrid, Valverde set up his side to play a very narrow-to-ball side 4-4-2 that relies on waiting for a backward pass to trigger their aggressive man-marking. Given that Barca always plays a high line, look for Atleti to try and get behind the defence via long-balls (perhaps Thomas Partey, if he starts, will test his long-range passing). Have a look at how Barca’s 4-4-2 mid-block works; you’ll likely see it given the way that Atleti like to build up. Now, let’s take a look at some Atletico analysis. How will Atletico Madrid attack Barca’s penalty area in possession? When Atleti faced off against Chelsea in the UEFA Champions League group stage a couple of weeks ago, you saw a continued trend at how Atleti like to attack at home – they like to play quick, fast, and direct in the hope they score first and can play on the counter for the rest of the match. Against Chelsea they managed to score first via a penalty, so their possession-based strategy didn’t work, but they’ll surely try this again against their Catalan rivals, so have a look at the formational patterns in which they use to attack opposition sides’ flanks. Essentially, Atleti like to put two central midfielders in central areas to recycle possession between the flanks where either full-back will link up with at least two forwards to form a triangle and use off-the-ball rotations to stretch out the opposition’s backline and find a low-cross to Antoine Griezmann. Will Barcelona counter-press Atleti and if so, when? Ah, the beloved Barcelona counter-press. Under Enrique, Barca’s counter-pressing system took a backseat to the focus revolving around keeping the ball and supplying the three-headed monster of ‘MSN’, but that is in the past and now Barca are counter-pressing yet again under Valverde. Fellow ESDF analyst, Edgar Faroh, recently produced an analysis report on Barca’s match against Espanyol. In the report, he broke down how Valverde’s counter-pressing system works. Given that Los Rojiblancos will likely be pushed into the super compact low-block at some point on Saturday, Barca will use their multidirectional press when Atleti win back the ball in their deep defensive shell or if they lose the ball near the touchline as it is easier to press when there is already little space for Atleti to work. In Spain, it is always customary, amongst many clubs, to take advantage of teams trying to play their way near and out of the touchline flanks. How will Barca possess the ball to try and break Atleti down? Well, let’s just get right into this phase of play. Barca, under Valverde, can play a bit narrower down the central areas more than they used to. A lot of this comes down to making it easier to play with shorter, quicker passing and making your counter-press more effective as your players are closer together in case you lose the ball, but they also have been fortunate with Busquets’ return to top form. Have a look at how Barcelona exploited Real Madrid’s man-marking system in the Spanish Super Cup first-leg to possess in central areas. Oh, and Busquets is key. But, and that is a big ‘but’, Atletico Madrid defend in a more zonal manner, and they kill off the central axis pretty well, so how will Barcelona attack them if they can’t work the middle? As seen in the video above, Barcelona use more rectangle-shaped overloads down their left-side now that Neymar is gone. They’re likely going to have to find some cohesion on the flanks if Atletico are compact and organized down the middle. What if Barcelona play a three-at-the-back system? If Valverde goes for a 3-4-3 or 3-5-2, then Simeone will go with a zonal-based 4-3-3 mid or high-block to match and put pressure on Barcelona’s three CBs. That’s what he’s done in the past. Above, you can see that Atleti, just as they do in their compact low-block, smother the central axis with two banks of three (forward and midfield lines) and try and push Barca to pass to one of their full-backs to trigger strict man-marking along the touchline and set a trap for the Barcelona players closest to the ball-side. As mentioned above, they were massively successful last season when pressing Barca in a zonal 4-3-3. Atletico just need to be more efficient in front of goal. Just as El Clasico is must-watch television, so is Atletico Madrid vs. Barcelona. The quality of the players, the clashing of philosophies, and the points at stake among the top four in LaLiga are all essential viewing for any neutral. Barcelona are the favourites and they are the better side at the moment, but Atletico have got it right tactically in recent matches (despite poor scoring form) and don’t have to worry about Neymar AND Messi on Saturday. They can select man-marking duties with a bit more comfort on the little Argentine when in their world-class low-block. However, both teams will cancel each other out in many ways. Barcelona will 100% win if they can get Atleti on the counter due to Messi’s unstoppable nature on the break. But Simeone will likely pull Koke, Thomas, and Saul Niguez back deeper in possession to avoid this. Carlo Valladares prediction: 1-1 draw.